The two sides have been negotiating a possible plea deal in recent weeks. Butina, 30, is accused of acting as an agent of Russia in the Washington, D.C. area and faces charges of conspiracy and failing to register as a foreign agent. She was arrested in July for allegedly conspiring to infiltrate politically powerful U.S. organizations, including the NRA, in an effort to push Moscow’s agenda. Prosecutors say that Butina’s covert work was directed by Alexander Torshin, a former Russian senator and deputy head of Russia’s central bank who is close to Russian President Vladimir Putin, and who was sanctioned by the U.S. Treasury Department in April 2018 along with several other Russian oligarchs. [I]n 2015, Butina was the first person to get then-candidate Donald Trump to talk on the record about U.S. sanctions against Russia – and the fact that he wanted them dropped. In the months that followed, Butina allegedly continued with a series of efforts to work her way into the American conservative movement, with a specific focus on establishing connections with the NRA. 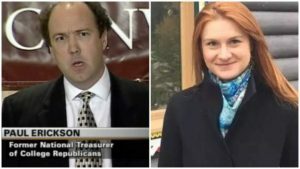 If the far-right gun group was used as some kind of conduit for Russian interference, a plea agreement between Butina and federal prosecutors could bring some much-needed sunlight to the lingering controversy..
Paul Erickson, a longtime Republican politico whose Russian girlfriend is in jail on charges she acted as a covert foreign agent, has been informed that he may face similar accusations. The Daily Beast reviewed a “target letter” that federal investigators sent Erickson’s lawyer, which said they are considering bringing charges against him under Section 951 of the U.S. code—the law barring people from secretly acting as agents of foreign governments. The letter also said the government may bring a conspiracy charge against Erickson, who is the boyfriend of accused foreign agent Maria Butina. The letter, which was sent in September by investigators working out of the U.S. attorney’s office in Washington, does not accuse Erickson of any crimes or guarantee that he will face charges. Prosecutors in the D.C. U.S. attorney’s office charged Butina with violating Section 951. “Charging an American under 951 in the context of the Russia investigation is especially serious because that statute is generally reserved for espionage-like cases, such as intelligence-gathering on behalf of a foreign government,” said Ryan Goodman, a former Defense Department attorney who now teaches at the New York University School of Law. “Essentially what it would say is that an American was acting to advance the interests of a foreign power, contrary to the interests of the United States of America,” said Renato Mariotti, a former federal prosecutor. As The Daily Beast previously reported, several of Erickson’s former business partners have claimed he defrauded them. The U.S. attorney’s office in South Dakota is leading an investigation into those claims. Justice Department investigators aren’t the only ones interested in Erickson. Staffers with the Senate intelligence committee, which is probing Russian meddling in the 2016 presidential elections, have also asked to speak with him. 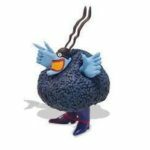 But a lawyer for Erickson told them he would plead the Fifth Amendment if subpoenaed to testify, a source familiar with those communications confirmed to The Daily Beast. Investigators will not force Erickson to appear just to take the Fifth. According to The New York Times, Erickson wrote an email to the Trump campaign in May 2016 offering to set up a back-channel meeting between the candidate and Russian President Vladimir Putin. By then, Erickson had known Butina for years. Butina, a gun-rights activist from Russia, attended grad school at American University while building relationships in the U.S. conservative movement, with Erickson often serving as her guide. The pair made no secret of their affinity for Russia. As The Daily Beast previously reported, at her birthday party, she dressed as a Russian empress and he dressed as Rasputin. Guests drank vodka from a bottle emblazoned with a hammer and sickle. And as Butina built relationships with conservative leaders, Erickson didn’t exactly keep his role under wraps. According to court documents filed by the prosecutors charging Butina, someone called “Person 1” and widely believed to be Erickson boasted that he was involved in “securing a VERY private line of communication between the Kremlin” and the Republican Party. The two also worked together on various other projects, including a deal to secure Russian jet fuel for an American middleman. Erickson and Butina worked on the failed business venture with Donna Keene, the wife of former NRA President David Keene, in 2017. Special counsel Robert Mueller is not handling Butina’s prosecution. A spokesperson for his office declined to comment on why that is. Alleged Russian spy Maria Butina has changed her plea to guilty, according to a new joint motion filed by her attorneys this morning. As her attorneys were negotiating the plea deal, her partner, GOP operative Paul Erickson, lawyered up in light of reports swirling that he too may be targeted by federal prosecutors as a covert Russian agent. Meanwhile, David Keene — a paid member of the NRA’s board of directors and former president of the gun rights organization who has faced scrutiny over ties to Butina’s alleged Russian influence operation — has registered as a different type of foreign agent lobbying for Argentina’s government. Keene and Erickson have a long history together dating back to the 1990s when they were registered foreign agents lobbying, in collaboration with Jack Abramoff, for a well-known “dictator” to gain entry into the United States. Meanwhile, DOJ scrutiny on Erickson is only heating up. The Daily Beast reported reviewing a “target letter” from federal investigators that they are considering charges against him. Unlike the rare but increasingly common charges brought under FARA, Erickson is reportedly being targeted for violating Section 951 — the same statute Butina was indicted and jailed for violating. In December 2015, Butina’s Russian gun-rights organization called the Right to Bear Arms sponsored an NRA delegation to Moscow where attendees met with influential Russian officials including former deputy prime minister Dmitry Rogozin who had been under U.S. sanctions since 2014. The convoy to Moscow included Keene, Trump campaign surrogate Sheriff David Clarke, president and CEO of the Outdoor Channel Jim Liberatore, soon-to-be NRA president Peter Brownell and NRA donors Jim Gregory, Arnold Goldschlager and Hilary Goldschlager. Alexander Torshin — a Russian politician and longtime associate of Butina who has since come under U.S. sanctions — played a key role in the trip and, allegedly, Russia’s decade-long operation infiltrating American conservative groups. A conservative Nashville lawyer named G. Kline Preston IV who has done business in Russia claims that he first introduced David Keene to Torshin in 2011 while Keene was NRA president. Keene and Torshin quickly forged an alliance based on mutual interests. In 2011, Maria Butina became founding chair of a new Russian gun rights group called the Right to Bear Arms. Erickson accompanied Keene to the 2013 conference, where he reportedly first crossed paths with Butina. Senate intelligence and finance committees have reportedly requested documents on the NRA’s connections to Russia, including documents related to whether the NRA took Russian money and the 2015 delegation. After spending a record $54.4 million to put President Donald Trump in the White House and support Republicans in Congress, the NRA’s membership dues dropped precipitously the following year. 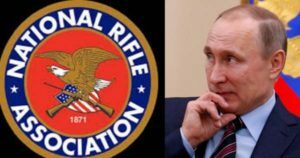 Although the NRA’s lawyers initially denied the Russian money, they eventually admitted to receiving “a total of approximately $2,512.85 from people associated Russian addresses” and “about $525” from two Russian nationals living in the United States in a letter to Sen. Ron Wyden (D-Ore.). The NRA also acknowledged “membership dues” from Torshin, who has been a non-voting life member of the NRA since 2012 — the year after he first connected with Keene. Even after his term as president of the NRA, Keene has maintained a cozy relationship with the gun rights organization. Keene is still listed as a director on the NRA’s’ board paid $32,000 last year for working an average of one hour per week, according to a new tax return reviewed by the Center for Responsive Politics. Keene’s wife, in collaboration with Erickson, reportedly offered Butina $1 million to help secure 5 million barrels of Russian jet fuel — nearly two times all of Russia’s refineries exports in a month — in an unsuccessful scheme to sell the fuel through an American middleman in 2017. Amidst all of the buzz surrounding his ties to alleged Russian agent Maria Butina, NRA board member and former NRA president David Keene took a different approach, registering as a foreign agent representing the interests of the government of Algeria. Unlike Butina and Erickson, who are alleged to be Russian agents under Section 951, Keene has now registered as a foreign agent, according to FARA filings made available through CRP’s Foreign Lobby Watch tool. One chapter of Keene’s lobbying history has made even fewer headlines: The time he, Paul Erickson and Jack Abramoff were lobbying for a widely recognized dictator’s entry into the United States. Abramoff has again been implicated in Erickson’s schemes related to Butina, though the full extent and scope of Abramoff’s role is unclear. Anti-fraud investigators at Wells Fargo bank, acting on a tip from federal investigators, flagged potentially suspicious bank transfers from an account held jointly by Butina and Erickson to what appeared to be a shell company tied to Abramoff’s family. Erickson sent wire transfers for $15,000 to a California company incorporated in March 2017 out of the home of Abramoff’s son who is listed as its CEO and sole director while Abramoff’s brother is the registered agent. NPR, Depth Of Russian Politician’s Cultivation Of NRA Ties Revealed. Rolling Stone, Inside the Decade-Long Russian Campaign to Infiltrate the NRA and Help Elect Trump. McClatchy News, FBI investigating whether Russian money went to NRA to help Trump. CBS News, Timeline of Russian plot to infiltrate NRA and GOP. Everytown for Gun Safety has an interactive microsite, Everytown.org/NRA-Russia, which details longstanding ties between the NRA, Russia and Trump world. For clues on how Russian money laundered through the NRA made its way into support for the Trump campaign, see a new joint report from Mother Jones and The Trace, which lays out strong evidence that the Trump campaign and the NRA illegally coordinated $30 million in political spending to boost Trump in 2016. This is potentially additional campaign finance felonies in addition to the two campaign finance felonies identified in the Michael Cohen Sentencing Memo involving unindicted co-conspirator Donald Trump. Alexander Torshin, whose assistant [Maria Butina] is closing in on a plea deal with U.S. prosecutors after being charged with acting as a Kremlin agent in Washington, is leaving his position as deputy governor of Russia’s central bank. Torshin retired, the Russian regulator said in a statement Friday. He turned 65 Tuesday. … While the official retirement age at the central bank is 60, employees are allowed to continue working beyond that. Torshin assumed his current post in January 2015, when he was 61. The central bank declined to elaborate on its one-sentence statement Friday. Torshin did not immediately respond to attempts to reach him. Butina helped organize a Russian delegation led by Torshin to the National Prayer Breakfast in Washington in early 2017. President Donald Trump attended the event, but a separate meeting with Torshin the Russians had sought didn’t take place. In April 2018, the U.S. imposed sanctions on Torshin, part of a swath of measures aimed at punishing “Russia’s malign activities,” including election meddling. A lifetime member of the NRA, Torshin said in a 2016 interview that he first met the future U.S. president in at the organization’s annual meeting in 2015. Torshin, a former senator from Russia’s ruling party, is suspected by Spanish prosecutors of having links to organized crime. He’s denied those allegations and was never formally charged. Support volunteer citizen journalism at the Blog for Arizona with a donation today. Your secure contribution keeps the Blog online and sustains a free press in Arizona.